[prMac.com] Sewanee, Tennessee - The Highly Technical Doohickey Company, developer of innovative information management tools, has announced the release of TickerMenu 1.0, a Mac OS X-only application that makes it simpler than ever to keep an eye on current stock prices by displaying them in the user's menubar. 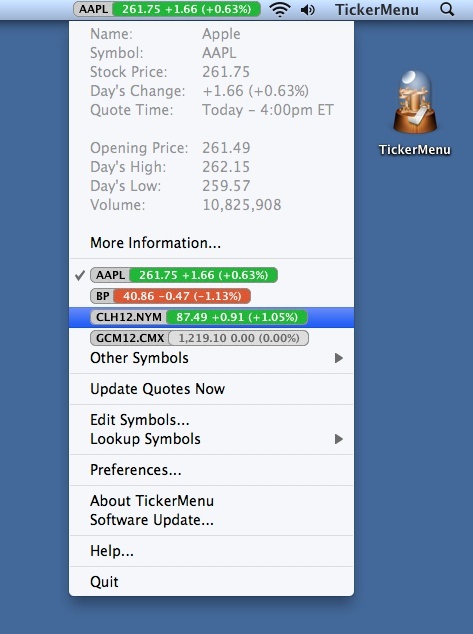 TickerMenu brings new simplicity to monitoring Stock Prices in OS X. "TickerMenu makes monitoring stock prices simpler that it's ever been on the OS X desktop," said W.L. Phillips, lead developer for the Highly Technical Doohickey Company. "To check a stock price while working in OS X, users often have to switch to another application or bring up a widget, either of which can be a distraction from other work the user is trying to accomplish. TickerMenu solves this problem by putting current stock prices right in the menubar, so the user can follow them with just a glance." * Stock prices are updated automatically. * Stock prices are color-coded to reflect daily increases (green) or decreases (red) in price; users may also select a greyscale display instead. * Clicking on a quote reveals more information about the stock and its trading activity, including the day's high and low prices and trading volume. * A click of a menuitem leads directly to full information about a stock available from a variety of popular financial websites. TickerMenu is built exclusively for Mac OS X and is compatible with either version 10.4 (Tiger) or version 10.5 (Leopard). TickerMenu is immediately available. It is free to try, and a registration code may be purchased for only $8.95 USD. More information about TickerMenu, including a demonstration video, can be viewed at the TickerMenu website. Located in Sewanee, Tennessee, USA, The Highly Technical Doohickey Company (Motto: "Mostly beakers and sprockets") develops innovative information management tools for Mac OS X. Copyright 2008 The Highly Technical Doohickey Company. All Rights Reserved. Apple, the Apple logo, are registered trademarks of Apple Computer in the U.S. and/or other countries.